After passing the bike plan last week, the City of Houston is now looking to expand it further by integrating freeways into the system to enable faster long-distance commutes. Eventually, separated bike lanes will be added to the left shoulder of most major freeways, enabling cyclists to simply enter the freeway using the regular ramps, merge left a few lanes, and then enter the bike lanes. 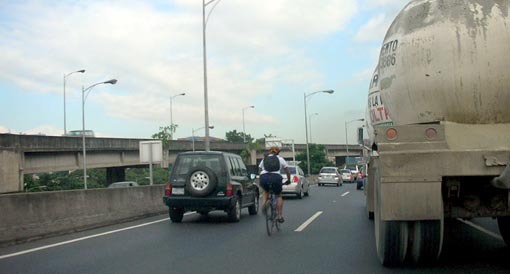 Until the bike lanes are added, cyclists are being encouraged to use the lane stripes as somewhat narrow bike lanes between rows of traffic (as demonstrated in the picture below), which has the added benefit of allowing multiple parallel cycling lanes and passing. 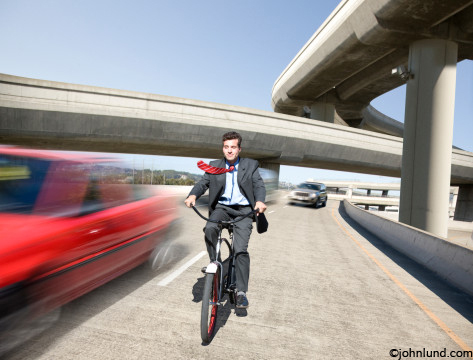 For safety, cyclists are encouraged to match speed with the flow of traffic, although with Houston congestion they will be going faster in most cases. In fact, accidents are expected to be minimal given how little cars actually move on Houston freeways. But please don't be this guy - at least wear a helmet. Safety first.